2016 growing season has started. How are we doing? A quick update after budbreak and the terrible frosts in Europe. 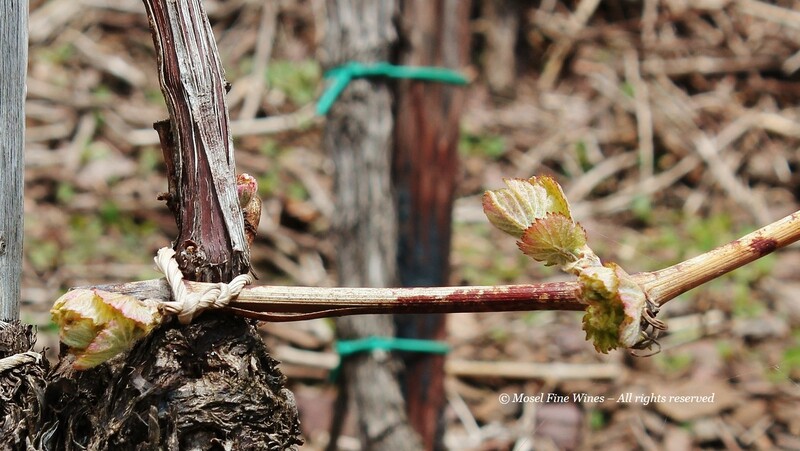 The winter was overall rather mild and this led to the first signs of bud break by mid-April. By the end of April, nearly all the buds had opened up, as the one above in the Rüberberger Domherrenberg, a scenic and stunningly under-rated vineyard in a Mosel meander between Bremm and Cochem. A spell of frosty weather at the end of April led to devastations in many parts of Northern Europe. Whole stretches of Burgundy, the Loire Valley and Austria were less lucky and suffered dramatic losses of up to 50% of the crop (if not more in some cases). Despite being situated way north, frost has fortunately not been a major issue in the Mosel. The weather proved not as cold as elsewhere and much of Mosel vineyards are on hillside (where cold air cannot stagnate) or protected through the warming effect of the Mosel River. However, the cold weather delayed the growth of the small buds. This exposed them to hungry caterpillars (in particular the willow beauty) or the common cutworm, which have then plenty of time to eat the young shoots, as you can see above. As Reinhard Löwenstein from Weingut Heymann-Löwenstein explained, "there is not much one can do expect go out at night and try to capture these pests by hand." Mosel Vintage 2016 | En Route to Flowering! The Mosel region has now successfully navigated through the last risk of frost (known as the “Ice Saints” on May 11-13) and the 2016 vintage should be happily cruising towards flowering now.